I don’t remember exactly what year it was—1989? 1990?—but I do know that it was before we had The Official Politically Correct Dictionary and Handbook, by Henry Beard and Christopher Cerf (New York, NY, USA: Villard Books, updated edition 1993), to explain it to us. A pity, that was. My friend had just come from a class in which he was outnumbered by wimmin (I’ll explain), including the professor, and people of color, who were reminding him that as a white heterosexual male he was enjoying “skin privilege” and wielding “gender-based power” that abundantly testified to his oppressor status. Alas, if only his vocabulary needs had been better met he might have more readily resigned himself to their verdict. Once white heterosexual males grasp the semantic issues involved, and see how not only wimmin (again, I’ll explain) and people of color, but all of society has been oppressed by the patriarchal subjugation of language, then perhaps we will finally be able to throw off its ego-testicle worldview and return to the pristine egalitarian existence we obviously must have enjoyed before it bequeathed us the phallogocentric account of our past which has been sexistly dubbed as “history.” If not, then perhaps we can follow Mary Daly‘s suggestion and develop the technology for practicing parthenogenesis on humans. 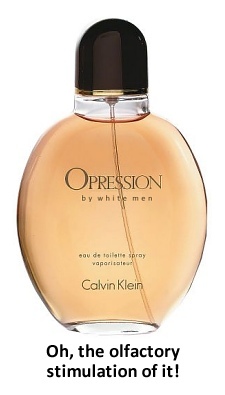 oppression. The discrimination against or suppression of individuals or groups, on the basis of what the Smith College Office of Student Affairs calls “stereotypes, generalizations and attitudes (conscious or unconscious).” Unless one possesses institutional power, the Smith Office points out, the means to discriminate against entire groups of people are unavailable. It follows, then, that in the United States, only whites—specifically, Eurocentric heterosexual white males—can, and do, behave oppressively. Now, because of the intertextual nature of all definitions (which all of us know from the experience of trying to interpret the words used in dictionary definitions by looking up their dictionary definitions), even with the help of Beard and Cerf on the meaning of “oppression” my hapless friend still may have failed to grasp his own oppressor status. This failure (or should I say, “incomplete success?”) would most likely have been due to a false assumption that he did not possess institutional power. He might have incorrectly reasoned that here he was in a seminary class with a professor who herself seemed to possess virtually all the institutional power in that situation—she could, after all, flunk him—and she had blatantly wielded that power to persuade the entire class to indict him as an oppressor solely on the basis of his gender, sexual orientation, and racial background. Doesn’t that make her the real oppressor, he might have cleverly asked? institutional power. Access to political, economic, and interpersonal resources (such as networking or social acceptance) within the dominant culture and its institutions. Notice the word “access” here. Institutional power, and thus oppression, is not about immediate enjoyment but ultimate access. Just because you can’t directly (from your point of view, at least) oppress people of color, non-heterosexuals, or wimmin (again, I’ll explain) today you are still indirectly oppressing them by the very fact that as a white heterosexual male you have access to resources within the dominant culture and its institutions that they do not. Perhaps you, Mr. Straight White Male, can’t oppress Oprah Winfrey or Ellen Degeneres like, right now, but face it: you could, eventually, someday—if you used the resources that are so obviously at your disposal, and can’t you see how that state of affairs is inherently oppressive and makes you, as its chief beneficiary, an oppressor? What could be more obvious? So if one of these oppressed, marginalized individuals happen to obtain, say, a political resource (such as a professorship at a seminary), an economic resources (such as a gun with which to rob you), or an interpersonal resource (such as a gang of thugs to help rob you), we must never think of this person as having obtained “institutional power,” because even though all these things may be in some way institutionalized in the first and second amendments to the U.S. Constitution (freedom of speech, right of peaceable assembly, right to bear arms, etc. ), they were obviously obtained through channels established outside the dominant culture and its institutions. 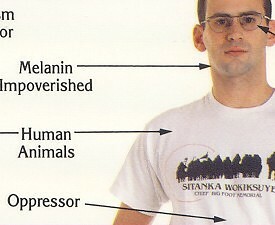 In fact, any misuse (or perhaps we should say, “non-culturally approved use”) of resources by a member of an underrepresented group (the preferred term for “minority,” which is obviously condescending in a democratic society) is automatically merely a consequence of the dominant culture, and that person is simply expressing his or her own victimization. wimmin. Nonsexist substitute for “women,” coined by the editors of the periodical This Magazine is For, About, and By Young Wimmin, who wrote in their first issue: “We have spelt it this way because we are not women and neither are we female…. You may find it trivial—it’s just another part of the deep, very deep, rooted sexist attitudes.” The singular of “wimmin” is womon. Example: After carefully considering a proposal to change the title of Louisa May Alcott’s Little Women to Vertically Constrained Wimmin, the Committee for an Inclusive Curriculum finally decided to ban it altogether. See also: wimyn; wofem; womban; womon; womyn. I don’t have time to refer to all the other alternatives to “women” and “woman” that Beard and Cerf cross reference here, but suffice it to say that the origins of those words help to significantly enhance our understanding of the term “feminazi.” But in the meantime we have demonstrated “how to be an oppressor” at the turn of the 21st century in the United States: simply be a white, heterosexual male. Simple enough. I think I can handle it.